Kyulux demonstrated a white OLED display that uses an orange TADF emitter combined with a blue fluorescence emitter. The novel display was developed in collaboration with the Fukuoka i3 center for Organic Photonics and Electronics Research (i3-OPERA) for demonstration at the 3rd International TADF Workshop in late July. The display was designed by i3-OPERA and Kyulux provided the orange TADF emitter. This demonstration successfully showed the commercial viability of a TADF-based white OLED display. Kyulux and the i3-OPERA will continue the collaboration to enhance the performance and the lifetime of this display. The next step in this project is use only TADF emitters including a blue TADF emitter. Today we have made an exciting announcement – Kyulux succeeded in improving the performance of its blue OLED Hyperfluorescence™ emitter. Hyperfluorescence™ materials are the fourth-generation OLED light emitting technology. The result will be announced at The 3rd International TADF Workshop to be held in Fukuoka on July 19th. Kyulux has succeeded in extending the lifetime of its blue material while maintaining its high external quantum efficiency (EQE) of 20% or more, at practical brightness levels. Kyulux’s latest material features an EQE of up to 26%, and specifically an EQE of 22% at 1,000 cd/m2 brightness. The emission wavelength is 470 nm at the peak value. The lifetime of the material is quoted at 100 hours at LT95 (at 750 cd/m2). An LT95 means that the brightness decreases 5% after 100 hours of use at a brightness of 750 cd/m2. Kyulux’s Hyperfluorescence™ is the world’s top performing materials at the moment, and the company now aims to work together with OLED panel makers to improve the systems further by optimizing the device structure and the rest of the OLED stack in pilot production lines. The first-generation OLED emitter systems, based on fluorescence, lack efficiency as only about 25% of the energy is converted into light. More advanced systems, based on phosphorescence (PHOLED), TADF and our own Hyperfluorescence (HF) technology all manage to convert almost 100% of the energy into light, and so it is mistakenly perceived that such systems all offer the same efficiency. The reality, however, is that Kyulux’s HF systems offer an inherent advantage that enables it to provide the most efficient OLED emitters of all four generations. As seen in the graph above, HF emitters are the only emitters that offer both a narrow spectrum and high-efficiency. 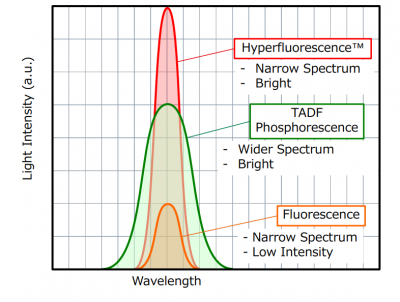 HF can be thought of as a combination of the high efficiency of TADF and the narrow spectrum of Fluorescence. In July 2017, Wisechip and Kyulux announced a collaboration to bring Hyperfluorescence-based PMOLED displays to the market – the first such commercial display ever. Kyulux’s Hyperfluorescence materials enabled wisechip to increase the display’s efficiency by 50% – meaning that the next generation PMOLED displays will draw half the power of current generation ones. Wisechip demonstrated a yellow PMOLED device that featured a lifetime of over 30,000 hours (LT50) and an EQE of 14.6%, while still maintaining high color purity. Wisechip aims to release the first yellow and green HF PMOLEDs by the end of 2017, with red, blue and white displays planned for commercial launch in the near future. 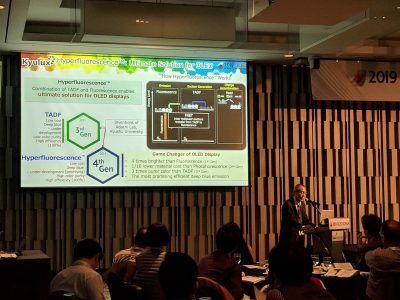 During the TADF Workshop which was held in July 2017 in Kyushu, Japan, Wisechip’s VP of R&D Engineering Division, Dr. York Tsai, gave a presentation that detailed the Hyperfluorescence-PMOLED development effort that led to the successful demonstration and future introduction. It was a great presentation that clearly showed the advantages of our materials and their applications in Wisechip’s PMOLED displays. During the 2nd international TADF Workshop, Wisechip demonstrated the world’s first Hyperfluoresence based OLED display, a yellow monochrome PMOLED that draws half the power compared to Wisechip’s current fluorescence PMOLED displays. The demonstrated display was a 0.96″ 128×64 monochrome (yellow) PMOLED. The EQE of the HF model is 14.5% compared to only 7.1% in the fluorescence display. We have now published the video above that very nicely shows the display in action and the whole demonstration – even though it is quite difficult to see just how brighter the HF display is. The image below shows this better.